Register before the early fee deadline and save $100 on fees. 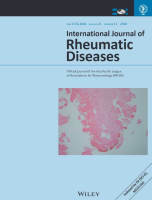 All BMJD accepted abstracts will be published as a supplement to the International Journal of Rheumatic Diseases, the official journal of APLAR. Click here to subscribe to BMJD Congress newsletters. 1. Chance to interact with International and Asian experts from all areas of rheumatology in one place. 2. You get, at one congress, updates on major topics of interest for your practice. 3. BMJD aims to reach consensus on controversial issues through debates and expert opinion.